From Stettin in the Baltic to Trieste in the Adriatic, an iron curtain has descended across the Continent. Behind that line lie all the capitals of the ancient states of central and eastern Europe. It was clear once the tide began to turn against Nazi Germany and Japan that postwar problems would begin to creep in to the joint effort to defeat the Axis powers. Following D-Day, the turning point on the Western front in Europe, the invasion of Saipan and the Marianas gave the Air Force a site from which to increase bombing of Japan. The Battle of the Philippine Sea and the “Marianas Turkey Shoot” crippled the Japanese Navy and air forces. If the end was not yet quite in sight, the tide had certainly turned. 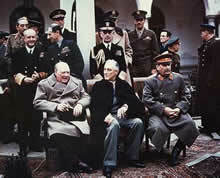 By the time of the Yalta conference in February 1945, postwar issues had grown in importance to each of the major powers. Germany was on its last legs, and the invasion of Okinawa would move the allies in the Pacific one step closer to the homeland of Japan. Roosevelt, Churchill and Stalin clashed at Yalta over postwar issues, and it is not too much of a stretch to say that the Cold War was actually beginning at that juncture. Churchill's speech quoted at the top was given in 1946, and by then it was clear from his comments, as well as from speeches by Joseph Stalin, that an intense struggle between the capitalist nations and communism was underway. The Cold War kept the world on edge for over 50 years, and the best that can be said of it is that it never erupted into the holocaust of nuclear war that many feared. For a time, during the 1950s, the question of the Third World War was less a matter of “if” than of “when?” People built bomb shelters in their back yards and school children practiced a-bomb drills. It seemed inevitable. 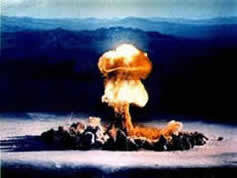 People talked about what it would be like after the third world war. Then came the Cuban Missile Crisis, and for those thirteen days, it seemed as if the unthinkable might really be about to happen. The Cold War Era was characterized by one factor: the “balance of terror,” or nuclear standoff between the United States and the Soviet Union. Under that shadow of potential nuclear holocaust, the NATO and Warsaw Pact (or Eastern Bloc) nations twisted and turned to advance their goals while avoiding the spark the might instigate a war of surpassing destruction. Most events of the period of international significance, from trouble in the Middle East, to wars of national liberation, to issues of developing nations in Africa and Latin America, were played out against the backdrop of the Cold War. The Cold War had many ramifications for the American people: the anti-Communist witch hunts of the 1940s and 50s; McCarthyism, and the anguish that the excesses of that period visited upon thousands of Americans; the Korean and Vietnam wars; and, most of all, the fear of nuclear war. The collapse of the Soviet Union ended the Cold War, but the remnants of that age—the thousands of nuclear warheads still in existence—are still with us. This section will be devoted to examining how the United States and its allies and adversaries dealt with the momentous issues of that time. We should heed the lessons of the Cold War to see what was done right, as well as what might, tragically, have gone wrong. We are still not out of the woods.